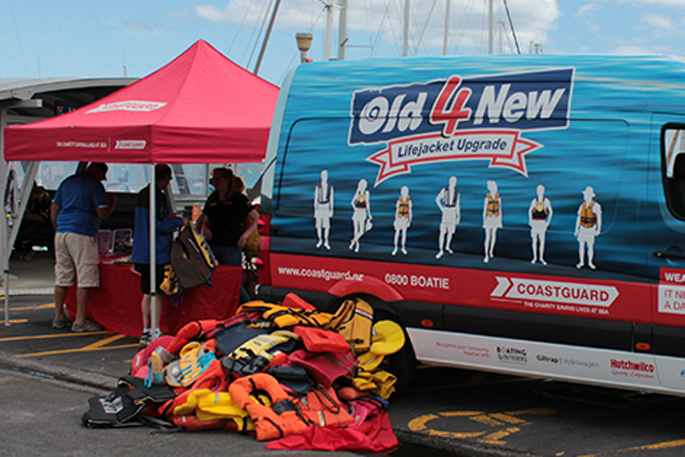 More than 1200 old lifejackets, some up to 50 years old, have been traded in for replacements under a Coastguard NZ safety initiative. "Old4New" campaign manager Aoife Healy says the nationwide programme had been running for five years and the current campaign started in December. The programme saw a "Old4New" van visit 56 locations in New Zealand. It began in Whangārei on December 1 and will end in Auckland on February 3. Aoife says the programme was "to get as many poor lifejackets out of the community" as possible and replace them with new, safer lifejackets for a discounted price. "One of the biggest issues is a lot of people still have what is called a kapok lifejacket," she says. "Kapok is a fluffy fibre similar to cotton and it absorbs water. It's used in a lot of old lifejackets but it is quite dangerous because it will become waterlogged." In December alone, 1200 old lifejackets were traded in and replaced with new ones, says Aoife. The team had received jackets that were between 30 and 50 years old, well past the life expectancy of 10 years for a well-taken-care-of lifejacket. Aoife says they had had people coming up to the van with unsafe lifejackets that were just four years old. She says it was important to take care of the lifejacket, as leaving it outside in the sun could cause them to break down. The most popular lifejacket for boaties that had been purchased from the van was an inflatable lifejacket that retailed for $139, Aoife says. From the van, the lifejacket could be purchased for $99 and it came with a crotch strap which Healy said was a "vital piece of safety equipment". Before the latest phase of the campaign began in December, about 10,000 unsafe lifejackets had already been taken out of communities since the safety initiative started.